Honestly, the only way to make this part of your business fun is to change your perspective on numbers and facts. It is a necessary part of business so you might as well make a game of it. Before you can establish your goals and where you want to go in your practice you have to know where you have been. The end of the year is a time for completion. It is time to take stock of the systems you have for managing your business - are you getting the information you need? 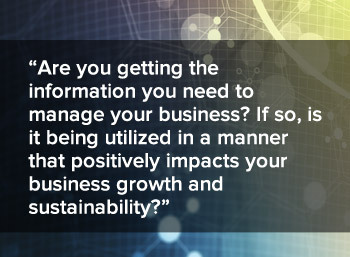 If so, is it being utilized in a manner that positively impacts your business growth and sustainability? Upon reading this if you realize that you are not using these approaches, then great! This is your opportunity to start them in 2014. What are the important components for you to realize with the statistics in your business? How many new patients, how many follow-ups? What is your dollar volume in services and in your dispensary? These are the basics, from there you can track your IV’s, shots, HCG packages whatever may be additional services in your practice that need to be monitored. It is best to keep your statistics on a weekly basis, if you track on a monthly basis you are looking in the rear view mirror. Tracking on a weekly basis answers the question; am I on track to meet the goals I set for my practice this month? It then gives you the opportunity to adjust your strategy if needed. Look at 2013; what were your averages, what actually happened in your practice? Use this information to also see trends in your business so you can create your marketing strategy for 2014. New Patient Tracking:This approach answers the questions; where are my new patients coming from? What is the volume of new patient phone calls? Is my staff (or the healthcare provider) converting those new patient calls to actual appointments? Am I successful in my free 15-minute consults? These questions, and many more, are answered with your new patient tracking system. This approach is as simple as capturing: date of call, patients name, phone number, referral source, did they make the appointment or not, and then a notes section for follow up. The biggest mistake offices make is that they don’t write down every new patient who calls the office, they only write down the ones who make appointments. To accurately use this tool you need to document all prospective patient calls. Returning Patient Tracking: This approach answers the questions like; what happened to Mary Smith? Are my patients complying with their treatment plans? Am I creating the long-term relationships that I envision with my patients? To develop a positive framework around patient adherence try tools like Remedy Reminder, which allow healthcare professionals to log into a portal to write prescriptions and post dosing/lifestyle instructions for the patient to access. The tool also creates reminders for the patient via their smartphone or email. If a patient leaves the office without their next appointment and/or cancels their appointment, your assistant captures the following information; date of visit, patient name, phone number, recommended next appointment timing and reason. You may have a tracking system within your Practice Management software program, just make sure you are getting those questions answered and most importantly doing regular, consistent follow up. By utilizing this tracking procedure it ensures that you have a systematic recall system for your patients; this not only takes care of the patients but also takes care of your business too. If you are not sure how to framework your tracking – you are not alone.Many of our clients at Breakthrough Coaching have these same concerns. Don’t be afraid to reach out to a partner to help you establish your tracking and analytic strategy. Often, it forces the tough questions to be answered. As we tell our clients, it is better to deal with the facts, and that the actions you take are effective in addressing the overall success of your practice. Anne Lague Zorich is a Lead Consultant at Breakthrough Coaching and brings a passion for working with Alternative healthcare practitioners which arose from her experience as a founder of a chiropractic clinic with her husband. The clinic began as a family based practice with 3 employees and grew to a large thriving practice with 16 employees grossing $2 million a year. Anne brings her clients the lessons she learned in 18 years of growing a practice, and now coaches to help others create clinics with strong foundations in business and exceptional customer service.